During the 1920's, some homes in this area had telephone service through old crank type telephones that were hung on the wall. In order to connect calls, a switchboard was placed in certain homes in a designated area. That’s how a home in the Oakley community got the name "the switchboard house," and it was in that house on the 16th day of November 1929, Stanley Carter was born. Stanley’s parents were John Carter and Elizabeth (Richardson) Carter. He was the fifth child in a family of ten children, six girls and four boys. Even though times were hard when Stanley was growing up, he said his family was never hungry. During the time he got to go to school, he attended grade school at Ozone. After completing the sixth grade, he quit in order to help work on the farm. They grew a large garden, had chickens, hogs and cattle. Every fall, molasses was made from the cane they grew. Wheat was another crop they raised. One decoration day at the Richardson family cemetery in the early 1950's, Stanley met the person who would later share his life and become the mother of their six children, Geneva Booher. Their life together did not begin until after Stanley was drafted into the United States army in 1951. His basic training took place in Fort Carson, Colorado, which was followed by sixteen weeks of special assignment at Dugway Proving Ground in Tuella, Utah. He received an honorable discharge in February of 1952, and he and Geneva was married on June the 9th that same year. Following his discharge from the military, he became a member of the inactive reserves, and later joined the National Guard. After enlisting with the National Guard, Stanley spent sixteen weeks in Fort Benning, Georgia where he took a course of advanced non-commission training. He completed his high school education while serving in the military, and in addition, furthered his education by taking several courses offered by the military during his time in service. 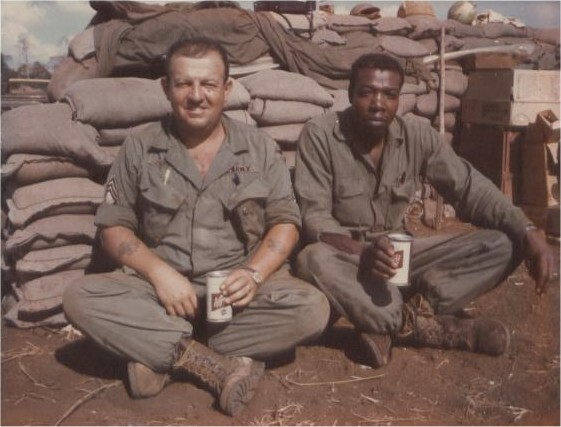 Stanley Carter and a fellow serviceman are shown enjoying a cold one while serving in Vietnam. Stanley and Geneva began their married life living in an old log home on property they still own today in the Taylors Crossroads Community. The house was built by a Reeder family, and after only three days of getting electricity run to this house, it burned to the ground. While living in the old log home, two of their sons were added to their family, Willie Joe and Jimmy. Following Jimmy’s birth, it was necessary that he have extensive treatment for a medical condition he was born with which required that he be hospitalized in Vanderbilt in Nashville for a period of time. It was at this time that Stanley decided to go back into active duty through the National Guard, and in May of 1957, he was sent to Schwaebisch Gumend, West Germany. By this time, a third son, Johnny, had been born. Stanley, along with Geneva and their three sons, spent the next three years in West Germany. In 1960, Stanley was sent back to the states and was stationed for the next fifteen months in Fort Lewis, Washington, a place Stanley described as very beautiful, and on a clear day, Mt. Rainier was visible. Their oldest daughter, Joan, was the next one to be added to the family, and around this time, Stanley and Geneva bought the home they still live in from Minor and Lurlene Coleman in the Taylors Crossroads community. The next two years, Stanley spent in Butzbach, Germany, while his family remained at home. In 1963, Geneva and the four children packed up and moved to Fort Sill, Oklahoma where Stanley was stationed for the next fifteen months. Next on his tour of duty, he was sent to Babbinghausen, Germany for one year. Geneva and the children returned to Tennessee. After returning a second time from Germany, Stanley was sent to Aberdeen, Maryland, and while he was stationed there, their daughter, Jean, was born. The year of 1967-68 is not an easy one for Stanley to look back on. That part of his military career he spent in Vietnam during the TET Offensive of 1968. Moving back and forth had become second nature to the Carter family by this point in their lives, and following Stanley’s tour of duty in Vietnam, Fort Sill, Oklahoma became their home once again. Then came South Korea where Stanley was sent for a year, and once more, the family returned to Tennessee. After completing that year in South Korea, Stanley once more returned to Fort Sill, Oklahoma, and again, his family packed up in Tennessee and settled one more time in Fort Sill. It was there that Stanley Carter, Jr. was added to their family. On September 1, 1975, some twenty-four years, six months, and eleven days later, Stanley retired from active duty with the military. The family came home to Taylors Crossroads for good this time, and all but two of their children, who now all have families of their own, live not too very far away. Their son, Willie Joe and his wife, Luba, live near Houston, Texas. Willie Joe, has a PHD in chemistry, and works for an oil refinery company. Jimmy, son number two, and wife, Janie, live in Livingston. Jimmy is employed with the Corps of Engineers as a park inspector. Johnny, the third son, and his wife, Sherry, live in Athens, Tennessee, where he has a medical practice as a family practitioner. Oldest daughter, Joan, lives on the old Carter home place near Taylors Crossroads, and works in Livingston at the West End BP. Joan is married to Dennis Brown. Jean and husband, Tom Jolley, live about half way between Livingston and Rickman. She teaches math at Livingston Academy. The youngest of the family, Junior and wife, Shanda, have a home in the Taylors Crossroads community. Junior is an employee of the Corps of Engineers at Dale Hollow Dam. There are a total of twelve very special grandchildren Stanley and Geneva enjoy very much, not to mention two great-grandchildren. The Carters live a quite and peaceful life at their home in Taylors Crossroads. Something Stanley enjoys doing everyday is going to the farm to check on the livestock. Junior and Shanda and their two little girls live there now. It seems very fitting that another home now stands proudly on that same property where the old log house once stood, the same place where Stanley and Geneva’s life together began. 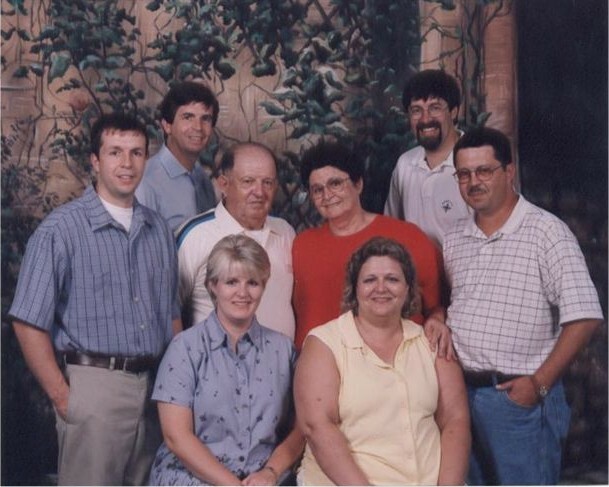 Stanley and Geneva Carter family. First row daughters, Jean and Joan; second row - Junior, Stanley, Geneva, and Jimmy; third row - Johnny and Willie Joe.